Glaucoma physicians frequently face dilemmas generated by atypical or complicated cases and must answer questions such as “yes or no,” “treat or wait,” “medication or surgery,” and “switch or add.” There are no gold standard answers to these questions. Treatment decisions are usually based on comprehensive evaluation of the type and stage of the disease, medical history, general condition, life habits, and life expectancy of the particular patient. Because glaucoma is a chronic, progressive disease that persists throughout patients’ lives, therapy should be always considered from long-term and holistic views. Primary open-angle glaucoma and primary angle-closure glaucoma are the two most important types of primary glaucoma. Although they share characteristics, especially in the relatively advanced stages, they have completely different pathogeneses, leading to different treatment strategies. In the first part of this chapter, we discuss basic questions about the principles of medical treatment for glaucoma, such as the goals for therapy, when to start treatment, how to choose medications, and to what extent we should treat. Due to the particular anatomical and physiological structure of the eye, ocular drug delivery remains a significant challenge because of various barriers that protect the eye from harmful exterior substances and also therapeutics. Currently, drug delivery methods for ocular diseases can be divided into topical and systemic administration. Topical delivery is used more common than systemic delivery in glaucoma treatment, mainly because of its convenience and high level of patient compliance. In the second part of this chapter, we discuss barriers and absorption routes for ocular drug delivery. 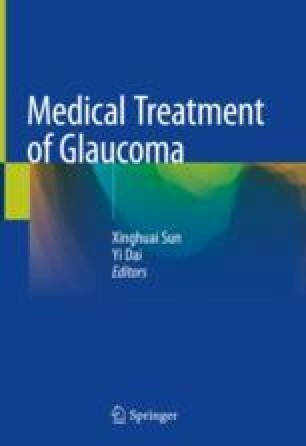 More importantly, we summarize delivery methods for various glaucoma therapy drugs in clinic settings, both topical and systemic methods. Y. Chen and K. Jiang made equal contributions to this chapter.